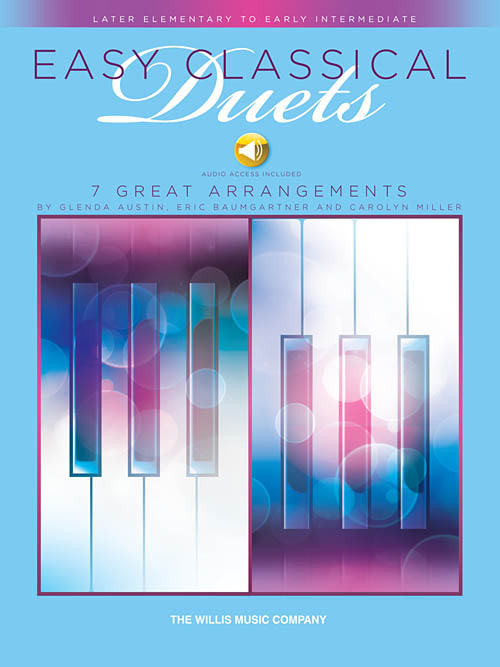 7 great piano duets to perform at a recital, play-for-fun, or sightread! These famous masterpieces are appropriate for any age and have been pared down to their essence and wonderfully arranged. In addition, online audio files of the Secondo and Primo parts are available to download or stream if your favorite duet partner is unavailable! A demo track of both parts together is also provided. Titles: By the Beautiful Blue Danube (Strauss) • Eine kleine Nachtmusik (Mozart) • Hungarian Rhapsody No. 5 (Liszt) • Morning from Peer Gynt (Grieg) • Rondeau (Mouret) • Sleeping Beauty Waltz (Tchaikovsky) • Surprise Symphony (Haydn).